building a good companionship among us in the future.” Duke Croos, coordinator of a program set up for the young people of the National Fisheries Solidarity of Mannar. 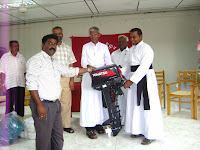 As a result of the discussion had been between the national convener of NAFSO Mr. Herman Kumara and Mannar bishop Rayappu Joseph 2008/09/02, today Mannar fishermen could receive fishing boats engines and nets from NAFSO. At the discussion they had discussed how to develop collapsed economies of North fishers and to make a companionship among North and South fishermen living friendly as all they are human being. NAFSO is working as a network of small scale fishers around the country and these fishing equipments were to be distributed for southern region fishermen before we visited North areas. After the discussion of Manner bishop we got to know there were many war affected fisher families in the Mannar district. 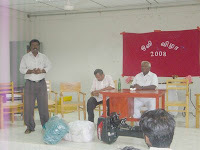 According to that southern fishermen suggested to help Northern fishers also by providing fishing nets and boat engines for fishing having shared our northern experience with them. 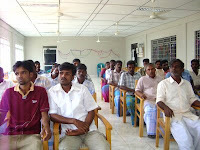 After selecting fishermen representing two co- operative societies St. Mary’s Fishermen Co- operative Society and Savariyapuram Co- operative Society in Arippu Marandamadu, Mannar, 15 out boat engines and 135 piece of fishing nets were distributed among fishermen. We would like to express any further to this is how people can help each other to build a better social system in dignity.